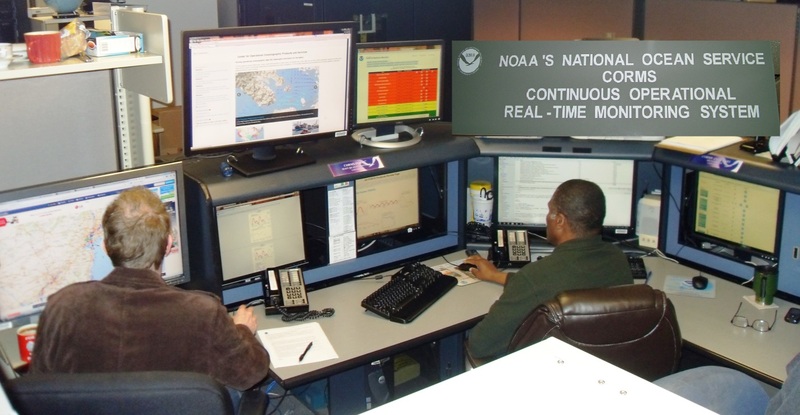 CORMS (Continuous Operational Real-Time Monitoring System ) is the central point of contact for CO-OPS (Center for Operational Oceanographic Products and Services). Established in 1998, CORMS is essentially the "watchstander" for CO-OPS, continually quality controlling and providing quality assurance for all of CO-OPS' real-time data, systems, and web products. CORMS is staffed by experienced oceanographic technicians working 24x7, ensuring the availability and integrity of more than 500,000 measurement points per day, originating from about 2,000 discrete oceanographic and meteorological sensors throughout the coastal U.S. In addition, they coordinate initial response or action on customer requests and notifications made by phone or email from CO-OPS field technicians, public users, and others. CO-OPS data and forecasts are available to users in real-time (or near real-time) in various formats, including online graphical products, text data, phone, and OPeNDAP. CORMS automated software and oceanographic technicians promptly detect system outages, data quality problems, and warnings (e.g., tsunami, hurricane, flooding), and resolve the issue or forward to the appropriate field technicians or IT personnel to enable corrective action.